Book Retail Ads in Indian Newspapers Instantly Online! Why Book Retail Ad in Newspapers? Retail classified text ads are mainly local ads which advertise new retail stores or ventures in and around a particular city. For Example if Audi is launching a new showroom in Kolkata, the category in which their advertisement would fall is Retail advertising. Retail text ads are simple run on line ads published in order to bring the launch or development or opening of a retail branch to the notice of consumers. Text ads are charged basis the number of lines and characters used in the ad. Better composition of your retail text ad means larger responses from consumers. Retail Classified display (CD) ads are concise ads with elaborate display and pictures. CD Retail ads can be made attractive and distinct with the use of numerous enhancements. CD ads can be beautified and enhanced in many ways and attracts a lot of consumer attention. 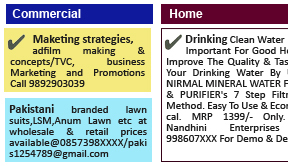 These ads are charged on the basis of per sq.cm of area used as per the length or width of the ad in the newspaper chosen by you. The number of customers or buyers you attract depends mainly on the composition of your Classified Display ad. 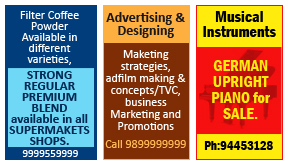 How to Book Retail Advertisement In Newspapers? Ad type selection is your first step towards booking an ad in a newspaper of your choice. This selection takes you to the page where you can select your category as Retail and you can further categorise your ad to reach out to a specific locality or a specific target area by selecting from a range of sub categories which include headings like Commercial, Home, Wedding Related etc. The responses you receive depend mostly on the composition of your ad. Composition of a retail classified ad is easy but it can also be creative and catchy. Type your text and you can use colour highlights, screen borders and other enhancements which have been assimilated on ReleaseMyAd to make your newspaper ad booking experience fun and memorable. Towards the end all you have to do in order to receive an instant confirmation with all your booking details via email, is to select the release dates and clear all your payments via our secure online (Credit/Debit Cards & Net Banking) or offline (Demand Draft, Cheque and Cash Collection) payment mediums. Q. We are interested in your service in releasing advertisements on a regular basis to showcase our products. Kindly depute your executive for discussion.